Ages 4 and up. Here is a collection of high-interest games that can be used to teach basic sign language to young children. A core vocabulary of 40 words is emphasized in this book as children play What's Your Sign?, "Around and Around, and other games. Sign Language Playing Cards. Each card includes a sign. These can be used as flash cards when teaching basic signs. Match 'em Up Boards. Students learn new signs as they match pictures of signs with pictures of objects. Sign-Tac-Toe. Each box on the playing board includes a picture of a common sign. The student must identify the sign before marking a box on the board. Around and Around. Each space on these boards includes a picture of a noun or a picture of a common sign. Students practice labeling and using signs as they move from one space to the next on the board. Make Your Own Gameboards. 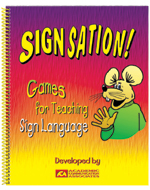 These playing boards have blank spaces so that students can create their own sign language games.